The Million Dollar Advocates Forum is pleased to announce that attorney Neil T ODonnell of Wilkes Barre PA has been certified as a member of the Multi-Million Dollar Advocates Forum. Mr. ODonnell is presently a Life Member of the Million Dollar Advocates Forum, the most prestigious group of trial lawyers in the United States. 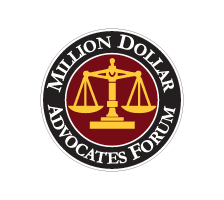 Membership in the Million Dollar Advocates Forum is limited to attorneys who have won million and multi-million dollar verdicts, awards and settlements. The organization was founded in 1993 and there are approximately 3000 members located throughout the country. Less than 1% of U.S. lawyers are members. Forum membership acknowledges excellence in advocacy, and provides members with a national network of experienced colleagues for professional referral and information exchange in major cases. Members of the Million Dollar Advocates Forum must have acted as principal counsel in at least one case in which their client has received a verdict, award or settlement in the amount of one million dollars or more. Members of the Multi-Million Dollar Advocates Forum must be Life Members of the Million Dollar Advocates Forum and must have acted as principal counsel in at least one case which has resulted in a multi-million dollar verdict, award or settlement. Mr. ODonnell is a member of both the Million Dollar Advocates Forum and the Multi-Million Dollar Advocates Forum. Mr. ODonnell is a graduate of University of Pittsburgh School of Law and specializes in plaintiffs personal injury, including auto, tractor trailer, products and bad faith cases.